If you have an open heart and want to join CMONA, we welcome your support! Make a direct impact on someone’s life through investing in CMONA’s core impact fund. It costs on average $137 to help each new family who walks through our doors and $1,100 to underwrite our ministry for a full day. Of course, investments of any amount are welcome. Make a long-term impact on many lives through investing in Forward in Faith–our capital campaign that will help us minister to more of our hurting neighbors–and minister more effectively–through building a new campus at 529 Belvedere-Clearwater Road. Our ministry outreach has doubled in the past 10 years, and our current facility can’t handle the increased volume and cannot support all the services our neighbors deserve. The new campus will give us more a more strategic location and the new facilities will provide more space, more security, and greater efficiency! You can donate food to our food pantry by bringing it to 646 East Buena Vista Avenue in North Augusta. Donations of non-expired food items are appreciated and accepted Monday through Friday from 9:30am-5pm and on Saturday from 9:30pm-4:00pm. We always need canned meats (beef stew, corn beef, tuna, salmon, spam, Vienna sausage), spaghetti sauce, peanut butter and jelly, fruit juices, soups, dry powdered milk, grits, oatmeal, cereals, macaroni and cheese, canned fruits, pasta, and rice. We also need paper products, cleaning supplies and personal hygiene items. 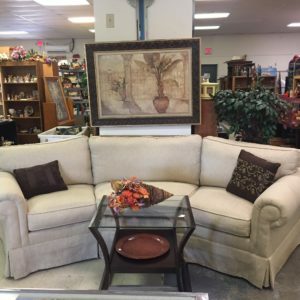 Donate gently used clothing, general household supplies and furniture, and boutique items like jewelry and fine art to our thrift store. Donations will be accepted Monday through Friday from 9:30am-5:00pm and Saturday 9:30am-4:00pm at 646 E. Buena Vista Avenue location.